Swimming upstream on the technology tide, one technology at a time. A collection of articles, tips, and random musings on application development and system design. I have been meaning to give the DWR (Direct Web Remoting) AJAX toolkit a shot for some time now. I consider myself a first generation AJAX programmer (as someone who has used XmlHttpRequest), but since I dont know any of the newer AJAX toolkits such as Prototype and DOJO, I just dont get no respect from the hotshot AJAX types (that was a joke BTW). Apart from that, considering that any session remotely related to AJAX played to overflowing crowds in this year's JavaOne, this was something I should have looked at quite some time ago. But since I dont do too much front end development, this was not something I needed to know, so I let it slide. So I finally got around to looking at DWR, and in this article, I describe an AJAX component using DWR and Velocity that can be served up within a portal-style page. The component provides CRUD (Create, Retrieve, Update and Delete) functionality for a business object. The component is modelled as a state machine. The state diagram is shown below, where the nodes are views provided by the component, and the edges are the operations that are permitted on it. In the example, I have used a BookReview bean (since I had some test data from one of my previous projects) but this strategy can be extended to allow any object to be exposed. 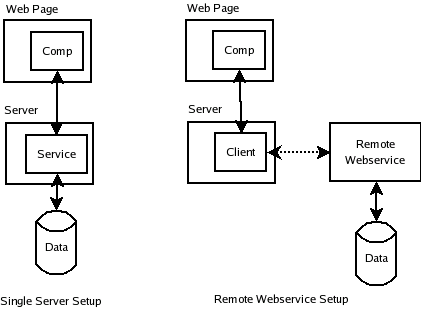 Also, in my example, the service that provides data to the state machine is a local JDBC service, but could just as well have been a client talking to a remote webservice to get data. Ability to cache Velocity templates on the server for performance. Why Velocity? Well, since we are bypassing the standard request-response cycle using DWR, I could not use JSPs, since JSPs need to have a pageContext populated by the controller at the end of the request-response cycle. The other option was to have generated the HTML directly in the service classes using System.out.println() calls, but that would have taken us back to the dark ages of web programming. Velocity templates provide a clean separation of the view from the model without forcing us to participate in the HTTP request-response cycle. In the case of the webservice setup, the templates can live on the front end application, and the component look and feel can be tweaked without any changes to the webservice client. Even in the case of the basic setup, having templates is more maintainable, since we can change the presentation without affecting the underlying service layer. The configuration is based on information in Bram Smeet's weblog and the DWR-Spring integration pages, so there is nothing new here, I am just including it in here for completeness. I list below the contents of the web.xml, dwr.xml and the Spring comp-servlet.xml. The Velocity templates have a 1:1 correspondence with the nodes in our state diagram above. The main.vm template represents the component as it will first appear when the containing page is invoked. Notice the span tag named "component". This is where all the subsequent content pulled from method calls on the BookReviewService bean will be put. The other pages are all_reviews.vm, add_edit_review.vm, single_review.vm and preview_review.vm. The all_reviews.vm contains the template for the list view, the add_edit_review.vm is the form template, and the single_review.vm and preview_review.vm are templates for the single book review view and the preview view (before saving). One thing to notice in the add_edit_review.vm is that it is not enclosed in a form tag. Enclosing the form in a form tag will make it do a request on submit, which we don't want. The main.vm template is used to provide an initial listing of BookReview objects in the database. The code for the Controller is straightforward, it just invokes the BookReviewService.getAllReviewsAndMergeToTemplate() method and writes directly to the ServletOutputStream. Maarten Bosteels suggested a way round having to duplicate the contents of all_reviews.vm. Always a good thing. 3) It looks as if all_reviews.vm is identical to the contents of <span id="component"> in main.vm ? Joe Walker was kind enough to put a link to this page from the "Tutorials and Articles about DWR" page on Getahead. Thanks Joe, I am honored. This way your BookReviewService methods could continue to return Beans rather than strings and DWR could handle the template glue. I do think that this would be a more generic way of doing things, returning beans and utilizing the power of DWR. I had toyed with the idea of JSP templates (since it is the dominant presentation approach), but I found it difficult to pull it out of the request-response cycle, so I went with velocity. Hi Sujit - Its really a great information about DWR and velocity. 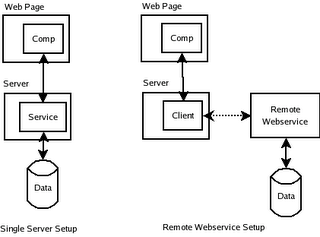 But I have a question - Is there any way to get request/session through DWR framework. I just have started reading on DWR, so couldn't get any chance to dig up the source code. My main motive is to use internationalization or other dynamic things which I may generate on the basis of some information stored in session. Please let me know if something clicks you. I was looking into DWR documentation and I found that framework automatically pass the corresponding HttpRequest/HttpResponse/HttpSession instances if we mark these in the method signature. Also DWR provides utility classes to achieve the same. For more information please read the following.. If I use DWR, probably I need to cut down this size of these files either by removing unwanted js functions or by compressing them through some tool. i could do all set up but its not working for me there is no error whils building the application. But when i access the URL its saying page not available . Hi Priya, did you take a look at the DWR debug page? Running your call through the debug page usually tells you whats going wrong with it. yes now i could display the first page that is main.vm but when i click on Add Review button . itsgetting resource not Found Exception . Can u pls tell the folder structure . I am using eclipse 3.3 DWr 2.0 and Spring 2.0.5 i could display the main.vm by setting the viewResolver in springapp-servlet.xml to org.springframework.web.servlet.view.velocity.VelocityViewResolver . @krishna: sorry about the delay in responding, good to know that everything is working now. Hi, thanks for the comment. BTW, apparently you have a namesake (2 comments up) who thinks exactly like you :-). Hi efe, looks like the blogger comment widget may have eaten up your summary. Hi Mary, you can get in touch with me through the blog comments like you did already. If you have a specific question, please include it in your message and I will try to answer it (although I am not an expert in either DWR or Velocity). I am a programmer interested in Semantic Search, Ontology, Natural Language Processing and Machine Learning. My programming languages of choice are Java, Scala, and Python. I love solving problems and exploring different possibilities with open source tools and frameworks.